On Wednesday and Thursday, the Stanford Language Center hosted several events to celebrate International Mother Language Day, an annual observance emphasizing language diversity that is recognized by the United Nations. Language tables clustered around and within the Language Center in the Quad offered glimpses into the cultures behind different world languages, featuring images and foods ranging from wagashi, a Japanese dessert, to mate, an Argentinian herbal tea. Students and language instructors stood by to speak with curious visitors. Event organizers intended to promote language-learning opportunities for students in and out of the classroom. “[Students] are encouraged to take language classes at Stanford, go on [foreign] exchanges and talk to us about any language-driven goals,” said Gabriela Badica, a Ph.D. student in Iberian and Latin cultures as well as a Stanford Spanish instructor who staffed the Spanish language table. Language programs used the event to spread awareness about their academic offerings. “[There are] few students, but even for a few students there is the opportunity to learn a very under-taught language,” said Kutay Serova ’20 at the Kazakh language table. Some Language Day hosts said that their programs face a recurring problem of low enrollment. “[According to our professor], at other schools it [is] really easy to get people to sign up [for Hindi classes]… and here at Stanford, we are struggling to get enough people,” said Priya Miller ’20, who staffed the Hindi language table. Various workshops, ranging from Lithuanian easter egg decorating to a Japanese Ikebana demo, occurred on Wednesday at the Language Center. One workshop included a musical performance by Mariachi Cardenal de Stanford. “I think it’s really cool that we were able to represent Mexican culture here,” said Cenobio Hernandez ’18, one of the performers in the Mariachi band. Another member, Francisco Lopez ’18, underscored the importance of connecting language to culture. “If you understand the lyrics, it’s another level of appreciation for the music that we are playing,” Lopez said. Event attendees ranged from Stanford students to curious tourists who were already walking around the Quad. Some students even attended for a language course. Justin Wilk ’20 said that he initially came to the event with his Spanish class but later decided to stay on so he could go to a German Döner-Kebab workshop. In addition to the workshops that occurred Wednesday, the Language Center hosted screenings of films from around the world, subtitled in English, on both Wednesday and Thursday. Although Stanford’s language requirement ensures that around 1,700 students enroll in language classes at any given quarter, there has been a drop in enrollment, according to Elizabeth Bernhardt, Stanford Language Center director. Still, some students are drawn to language study for the skillset. Other students are heritage learners who want to reconnect to their roots, says Eva Prionas, Classics lecturer and coordinator of the Special Language Program, which allows students to study languages that are not offered as Stanford majors or minors. The program offers Native American language classes such as Lakota, Cherokee and Navajo, as well as several other non-mainstream languages. “I decided to study Quechua as part of my Master’s in Latin American Studies, but part of the reason I applied to [the program] in the first place was because I wanted to explore part of my cultural heritage and also understand the Andean region as a whole,” said David Albán Hidalgo ’17 M.A. 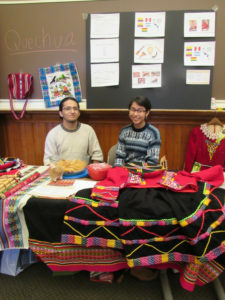 ’18, one of the hosts at the Quechua table. Quechua is a native South American language spoken principally in the Andes. Bernhardt echoed Mancall’s sentiments, arguing that, no matter the draw, language study forces people to opens their horizons to the lives of others.